Recalling Intergraph’s long history in hardware, servers and desktop software solutions, this iOS and Android based app may seem like a departure for the company, although it is very much a sign of the times. Intergraph has launched Intergraph Mobile MapWorks, an iOS and Android tablet-based app for viewing, editing and updating field asset information in real-time. It can be downloaded from Apple’s iTunes and the Google Play app stores. Field asset information can be accessed easily through mobile apps like this one, with very intuitive interfaces. Local government professionals use tablets as a matter of course in their field work, and find this type of application to be a perfect fit. 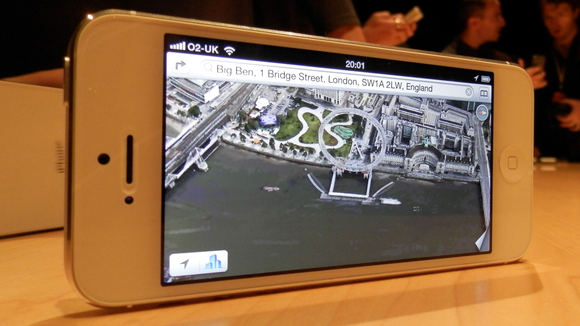 The iPhone 5 is accompanied by a lot of buzz, and some of that is pretty exciting. Customers of past iPhone models will be pleased to know that the iPhone 5 is made of all glass and aluminum, making it the thinnest yet. It measures 7.6mm thick, 18 percent thinner than previous iterations. It features “Ultrafast Wireless,” thanks to GPRS, EDGE, EV-DO, HSPA, HSPA+, DC-HSDPA and LTE. Esri President and CEO Jack Dangermond talked to Computerworld magazine about the importance of mobile and cloud, the role of GIS in organizations, big data and consumer vs. enterprise mapping.